The Global Angels “Earn Your Wings” 2009 campaign is off to an amazing start! Two of our Global Angels Ambassadors have made a new World Skydiving record, catapulting our fund raising for street kids and orphans in Asia, towards our $1 million goal. World Skydiving Champion, Wendy Smith from New Zealand, Tandem Master Tom Noonan from the US, along with Wing Commander Jai Kishan from the Indian Air Force, made a successful landing last week (28th October) at the Kala Patthar plateau, landing at an altitude of 17,192 feet (5,242m), near Mt. Everest Base Camp. Everest Skydive Worlds Highest landing Wendy Smith from GlobalAngels.TV on Vimeo. They are the only skydivers to land on this highest drop zone, which means it is potentially a new World Record ! This establishes the new team from Explore Himalaya, led by Wendy Smith, as one of the leading extreme adventure companies in Asia. This new feat firmly ensconces the Global Angels Angel Skydive Team in the adventure history books and is in preparation for next year’s adventures. In 2010 our team will be attempting even more skydiving records during May and October seasons and we are looking to encourage more adventurers to “Earn Their Wings” and join the Angel Skydive Team. Last year, we kicked off our “Earn Your Wings” fundraising campaign in September, when Wendy Smith, Tom Noonan and Global Angels Founder, Molly Bedingfield, all took part in an Everest Skydive. 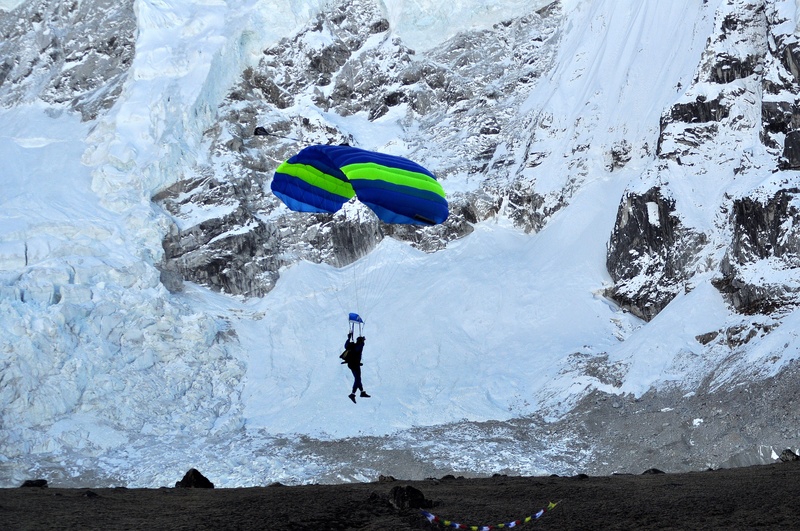 It was the first ever skydiving adventure in the Himalayas and to date the campaign has raised nearly $300,000 for street kids and orphans in Asia. Bello questo articolo e bellissima l&;#2178idea che, data la crisi selvaggia, credo avrÃ successo anche in altre cittÃ . Mi stupisco che qui al nord e a Milano in particolare non ci sia ancora nulla di simile.O mi sbaglio? Ci sono tanti Pino ma non lo si sa?